"Dione" is a satchel I created for my senior Fibers portfolio in the Sewing Tech class for Accessory Design. The idea evolved out of my desperate desire to have a multi-functional bag dressed up to look like a briefcase. While developing material, construction, design, technical skill, and the combination of hand processes, the project continued to evolve into one of a more personal nature. With just about two weeks to design and produce it, I saw the project as an opportunity to push and expand my skills in ideation, prototyping, and construction. It was also an opportunity to try to combine other technical processes with accessory design. "Dione" features a briefcase handle, a detachable and adjustable strap, strategically placed D-rings that allow for cross body or backpack use, buckles, a turn-lock, and a magnetic snap pocket protected by the flap of the bag. The flap is adorned with a hand screen printed design. It's body is a variation on gusset clutch construction -- the type of bag we were all assigned to make. However, it's size and other features were inspired by classic satchel construction. The materials I used to construct the bag are; pink, full finish, 3.75 ounce cowhide with mellow temper; chocolate brown, full grain, 7 oz cowhide; 5 oz white, full finish, cowhide; brass hardware; 7 inch YKK zipper; woven, striped cotton. The flap and body are fully lined and interfaced with a stiffener and joints are reinforced with tape. In order to be short enough for a cross-body and long enough for a backpack, the strap consists of two pieces. The attach with a buckle and loop. The strap reaches 45 inches at its longest and can be made as short as 34 inches. As a way of personalizing the product, I decide to screen-print the face of the bag. The mermaid design is a more developed version of an early logo prototype. To me, mermaids are symbolic of creative freedom and of curiosity. I altered the design with more elaborate line-work, a more original tail design, and by making the figures bare-chested as a representation of freedom of expression. 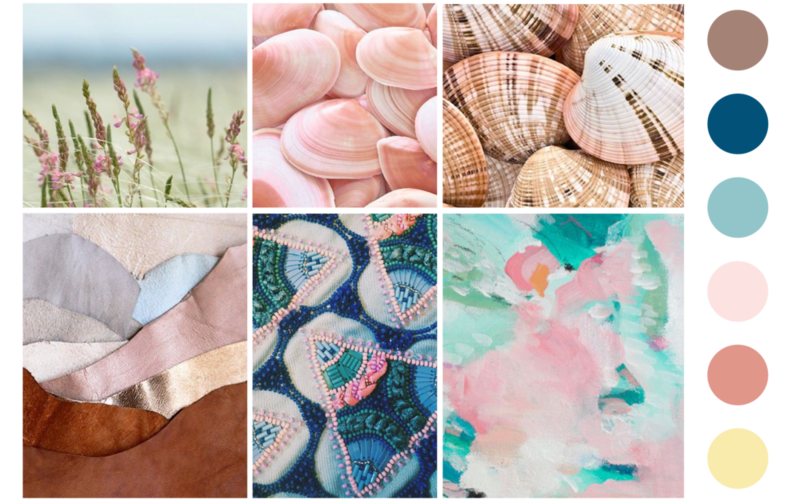 Scallop shells, kelp scrolls, and pearls reference the ocean. I integrated the mermaids into the space using decorative elements, which interact with the hardware and spread color across the face of the bag. I drew the design with the intention of screen-printing it. Using a black ink brush, vellum paper, and a compositional outline, I created five color separations. Using my bag prototype as a template, I drew the environmental elements as color separations also. The drawings were scanned, cleaned in photoshop, and then printed separately on transparency film to expose the screens with. I allowed the layers to overlap in order to create more color complexity and increase the appearance of highlights, tone, and shading. I cut four pieces of leather to be printed on; three drafts plus the final product. Due to the fact the the leather included seam allowances, I used my template to lightly mark the center, outer corners, and rivet spots. Using the spare leather, I tested the separations, the ink colors, and the screen placements, before completing the final print. The size of the screens and smooth texture of the leather meant I needed a friend to hold the screen while I pulled the ink (special thanks to Thomas Flynn II). It was also important to allow the ink enough drying time before printing the next layer because the finish of the leather meant it adhered only to the surface. A hairdryer was used to cure the inks.